tags: In 2019, the most precious natural resource... is us. In a world 10 years into the future, vampires make up the vast majority of the population with only 5% of the human race remaining. This presents particular challenges as the vampires' food supply - human blood - is dwindling and rationing is now the norm. There is growing evidence that vampires deprived of an adequate blood supply are themselves evolving into wild, vile creatures that attack anyone and anything in order to survive. Dr. Edward Dalton, a vampire and hematologist who works for a pharmaceutical firm, has been working on finding an artificial blood supply that will meet the vampire society's needs. He is sympathetic to humans and sees his work as a way of alleviating their suffering but his views on finding a solution change considerably when he meets someone who found a way to transform himself from being a vampire to again take human form. In the year 2019, a plague has transformed almost every human into vampires. Faced with a dwindling blood supply, the fractured dominant race plots their survival; meanwhile, a researcher works with a covert band of vamps on a way to save humankind. i remember renting this movie in store i am into vampires not really that much vampires i liked Blade and Blade 2 and Blade Trinity and From Dusk Till Dawn Franchise and i liked bleeding and Vampires by John Carpenter and all Vampires apart form Twilight crap and this movie was good Action Parts of movie but ending was kinda might not understand that well you might have to watch the movie but you going to enjoy the rest of action scenes and Ethan Hawke was really good acting in this movie i enjoy him and better name of character named Edward Dalton was better name then Edward Cullen of character who did Twilight Ethan Hawke is better Actor and name then Robert Patterson character called Edward Cullen can't F**king act stupid name for character. Daybreakers was better movie that need to be franchise rather the Twilight crap and Daybreakers was good film and character of Edward Dalton was good and working at hematologist for the pharmaceutical company Bromley Marks, the largest supplier of human blood in the United States and this movie is Australian directors but still American movie of actors still American movie and William Dafoe never become fan of him he was always bad guy in spider-man he is not bad guy all time and in this he is Vampire Hunter and the humans are hiding some another Area because of Vampires toke over the world and Humans are Hiding some another Area and women Claudia Karvan as Audrey Bennett character is Vampire Hunter like William Dafoe and then she trying to look for Vampire that she trust is Edward Dalton then he trust these 2 hunters then he find the cure that can change the humans back and William Dafoe was Vampire he kinda find the Cure was he was in car crash then he was on fire then fell into the water then he turned back into human i know it's confusing a bit then Vampire bites the human then they turned into humans and William Dafoe as character he was funny and great character he never does character like that before i believe he's movie character was noting special to me and you have to watch movie you will enjoy the action scenes and glory scenes and the all movie it's better then twilight crap A forty something vampire, Edward Dalton (Ethan Hawke) has been fasting, avoiding drinking the human blood that sustains life, while holding a corporate scientist position that explores the possibility of blood substitutes for vampires, in a way that echoes the current worldwide search for oil product substitutes. His boss Charles Bromley (Sam Neil) runs a soulless corporation that pretends through Public Relations campaigns, that its search for blood substitutes is the company's major product. In fact, the production and harvest of humans grown simply to provide blood for the majority vampires that dominate the earth's population, is the real profit center of Bromley Laboratories. Its like GE pretending its profits came from appliances and household products, while secretly most of the firm's profits came from its poorly understood financial arm. The plot details are so outlandish and sometimes comic that the ironists in the audience sometimes break out laughing. A school zone speed limit is shown in the dark, prohibiting speeds over 15 miles per hour between 2 and 3 a.m., apparently the only time vampire children are available to attend school. There's something familiar about actor Sam Neil's makeup as the CEO of Bromley Labs. It took me awhile to nail it down. Neil's eyes are like all the vampire eyes in the film, red at the center. Neil's cheeks and jowls arouse curiosity. Finally I figure it out. A special effect in Neil's face exactly replicates the cheeks and jowls of Bela Lugosi,the actor who first played Bram Stoker's Dracula for American moviegoers. So that's how the dice are loaded, eh!. Bromley knows that Dalton, his leading scientist on the blood substitute project is a liberal and a reluctant vampire. The two of them argue. Bromley notices Dalton's been dieting, drinking and eating no blood at all. He is starting to resemble the starving monstrous, homeless vampires in the street, who are suffering from blood insufficiency. Every day there are attacks on 'healthy vampires' by the Homeless. The police and the army search for the vagrants and exterminate them with as little public notice as possible. But the Public is aware what is going on, that they may be next. Nearly everyone who has become a vampire is either tempted into it, or assaulted by a vampire. Reluctant humans who refuse to become vampires, like Bromley's daughter, hide out in the badlands, just as the friends who surround Winston Smith in Orwell's 1984, do. Dalton is involved in a chance auto accident caused by a car load of non-vampires who have sneaked into the city bearing crossbows with silver tipped arrows, that cause vampires to explode and disappear when the arrow tip merely pierces their skin. Dalton finds himself protecting the 'Humans' from police. The 'Humans' escape, but when Dalton returns home the following night - the vampires are up only at night- the fetching girl 'human' is waiting for him. She wants him to meet another 'human.' in one of the few outside settings produced in the entire film, Dalton meets Lionel "Elvis" Cormac (Willem Dafoe), a human with a secret that is key to the planet's dilemma. The two humans want Dalton to help them find a scientific solution. The world's human blood supply has become scarce with the offing of most humans by vampires. Both vampires and humans have a common problem. Life itself, for those alive and the Undead too, is disappearing. The 'human' woman Dalton is attracted to, hides out in an abandoned winery her parents once owned in the Napa Valley. At the Winery, Dalton learns that Cormac had spent many years as an active vampire when a chance accident involving exposure to the sun, miraculously restored him as a human being. If Cormac's transformation can be figured out, there's a chance 'humans' can make a comeback. Back at Bromley, the boss is onto the defection of his chief scientist. Bromley has also learned the whereabouts of his still 'human' daughter. He enlists Dalton's younger brother, who bit Dalton years earlier to save his 'life', to capture the daughter. Dalton meanwhile discovers an enormous vacuum wine vat, from which the oxygen can be removed in seconds, to conduct experiments to find out how Cormac became human. Dalton's subject for experimentation: Himself! Meanwhile, the Bromley forces find and capture Bromley's daughter and learn where Dalton, Cormac and the girl are holed up. In the Napa Valley the experiments begin in earnest. There's the usual mad chase to see whether the vampires or the 'humans' will be survivors. 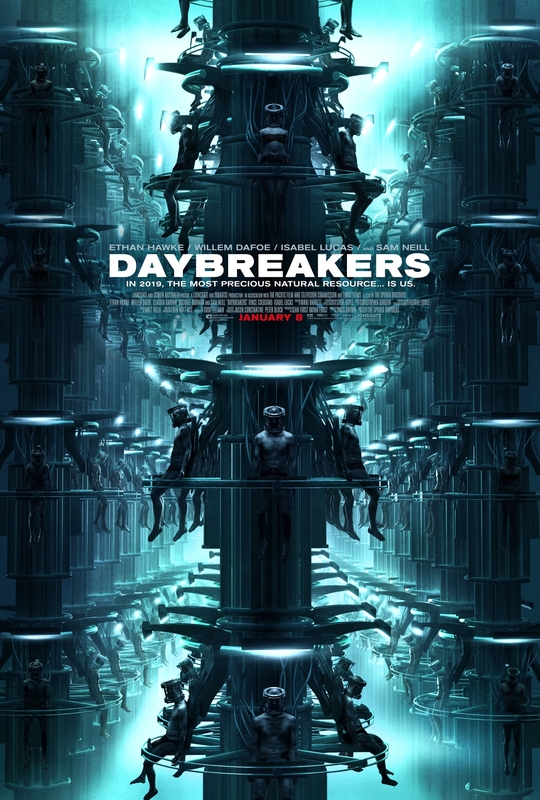 Near the end I realize there is an enormous hole in Daybreakers. There isn't enough life in the film. There are lots of vampires and 'humans' around, but after awhile the extraordinary sets are revealed to be just the same old laboratory gray and black over and over. The movie needs badly to spend more time outside where the vampires aren't comfortable. The film mostly doesn't go there. The natural world of human beings is missing and missed in this film. Not until nearly the end does it dawn that the film is completely shot in front of special effect blue screens, using computer matte in place of real sets. It isn't just the sparseness of humans and dead-eyed vampires that casts a pall, the constant dull dark sets are deadly too. The film would be better if there were more natural landscapes.